Bow 1978 by Ray Walker. Household Paint. A sunny sight even on a dull day. There are only a handful of murals that have survived from the late 1970s period of mural painting. One of these is the large piece painted on the back hall of the Bow Mission,also known as Bow Road Methodist Church. It is quite faded; the red colours having nearly disappeared so that it looks like the artist’s colour palette was blue and yellow! 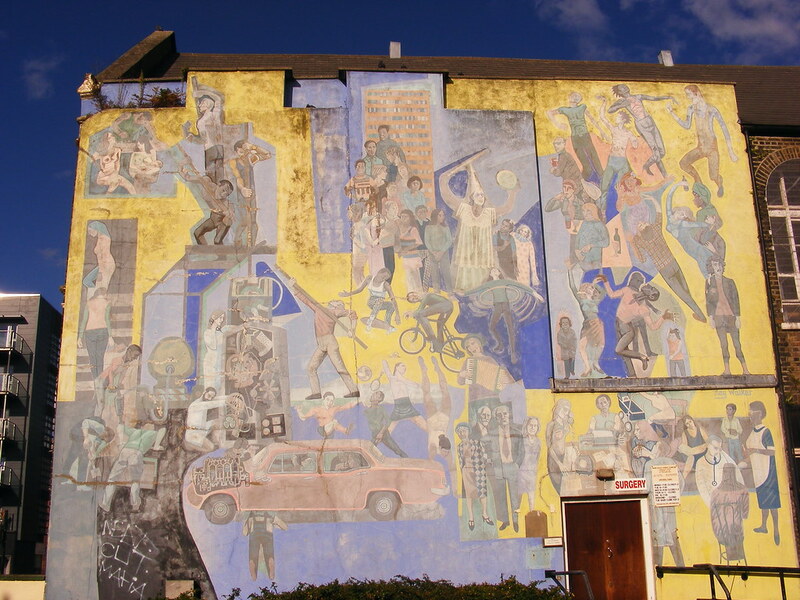 The mural was begun in early 1978 when Richard Smith of the Bow Mission approached Ray Walker to paint a mural to ‘brighten up a drab wall which faces a new estate’. Ray had assisted on a mural and had painted large paintings but this was his first outdoors full scale piece for the community. He had felt inspired about the opportunity public art had to offer, not only in making his work available to a wider audience but also working with locals to create something for them. The mural shows scenes of people working, playing, feeding, visiting the doctor and attending school. According to Bow Mission report, Ray Walker says he was ‘trying to reflect through the mural images of fate without remorse within a working class community.' He was showing the locals a reflection of the day to day experience of their lives without glamourisng or patronising. As a whole, the mural shows Ray’s lack of experience in painting on this scale and seems to be a series of small painting glued together by style and colour. However each piece is a treat and his approach adds another dimension to the range of painting styles on display by the London Muralists. This work is the only whole mural remaining which has been designed and painted by Ray Walker. The mural has been repaired once by artist David Bratby in the 1980s. However since then it hasn’t been touched. It hasn’t be graffiti'd either so perhaps it stands a good chance of being around for another 10 years or more. The mural has suffered from damage due to the addition of two girders across the face of the girders. The top part of the mural has been painted over. More information can be found here. The mural is quite faded with signs of cracking through out the render. There is a small amount of graffiti. Two girders have been placed across the top of the mural. Part of the mural has been removed and a red filler has been applied to the cracks. If you know something about this mural that we have missed the please get in touch. Find Bow Road Tube Station. When you come out, take a left. Walk down pass one street and turn down the second street. The road takes a curve. Follow it. The mural is on the end building. Get involved, join us on Facebook!